Hope you all got a bit of a giggle out of hubs' April 1st recipe....I'd say it was an April fools' prank...except that he really does bake hockey sticks. ALL.THE.TIME. ;) Last week, he even baked his brand new hockey skates (oven at 80C, turn off, then heat for 15-20 minutes....if anyone was curious). Apparently the skates are now exponentially more awesome than they once were. I've been in a bit of a cooking funk lately, so we've really been exercising our 'finger cooking' muscles (oh except not from BP, because they don't deliver to our backwoods neighbourhood). I'm actually kinda sick of take-out, especially since there are only three places in my area that are even remotely decent (pizza delivery, greek delivery and the most scrumptious Indian take-out place in the ENTIRE world.) Not joking - their channa masala is legendary. I didn't want to have to go get groceries, so I based my dinner around what I could find in my fridge....though a little random, it's surprisingly enjoyable and at least it's something I can feel good about eating. 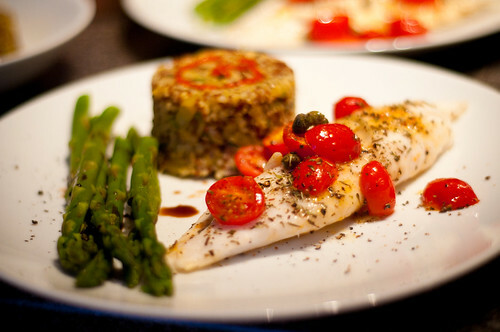 I based the meal around some frozen tilapia I had in the freezer, finding a great papillote recipe on epicurious (of course, the recipe is for sea bass, but as with most fish recipes, it's no big deal to just substitute another white fish). If you've not tried papillote cooking, I'd highly recommend it....it's pretty simple, usually very healthy and gives you moist, delicious results. This recipe in particular, baked on a bed of lemon slices, and topped with a garlic/tomato/caper mixture, just reminded me of provence. And that made me all reminiscent and nostalgic about the amazing trip hubs and I took (back in October) to Europe (you can check out our trip blog, if you're interested in more deets). It's fresh and wonderful. You could definitely serve it to company, or just make it and enjoy...doesn't take too long to come together. For a side, in my pantry I had ridiculous amounts of both quinoa and sweet potatoes...so I decided to seek out a recipe involving one or both of those ingredients. In my Clean Food cookbook, there was a tasty-sounding recipe involving quinoa, currants raisins and onions. I had to make a couple of substitutions based on availability, but it turned out fab. To round out the meal, I served with some *(only slightly sketchy!) asparagus and some sliced cucumber. 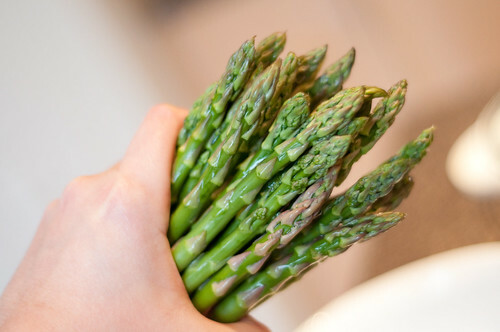 I just cooked my asparagus in the microwave (lazy way!) and drizzled a tiny bit of balsamic on it. Very easy and super delish. I hate steaming veggies on the stove because you end up dirtying too many pots...I'm all about the nuked veggies. Just put them in a covered glass dish with a sprinkle of water. Unfortunately (as you'll see in the pics), my asparagus is a touch overdone, because my fish was a tiny bit frozen and took longer than expected to cook. Imma say it now, whatever sick troll said you could just defrost food 'overnight in the refrigerator' is a DAMN LIAR. Has anyone ever put something in the fridge overnight, and come home the next day to anything but a rockhard brick of ice? GAH. My fish was still a little icy when I started dins tonight, and even the 45 minutes on the counter (before I was ready to throw it in the oven) seemed to do little for its crystalline plight. That said, this meal was great. Lil Z (who helped out the entire way through....check out the pics if you don't believe me) proclaimed that it was "AWESOME AWESOME" and gobbled nearly an entire fillet of fish, as well as the sides. Have I ever mentioned that I just love this kid? 1. Put oven rack in middle position and preheat oven to 400°F. 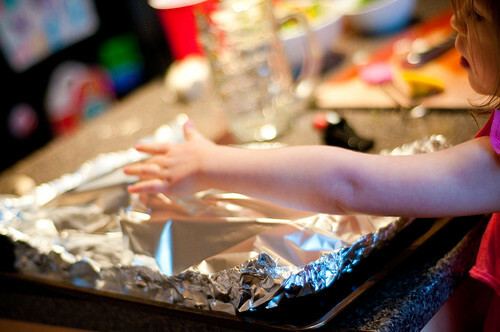 Line a large baking sheet with heavy-duty foil, then drizzle with 1 tablespoon oil. 2. 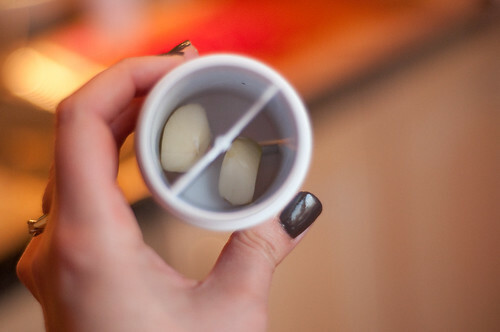 Arrange lemon slices in pairs (2 per fillet). 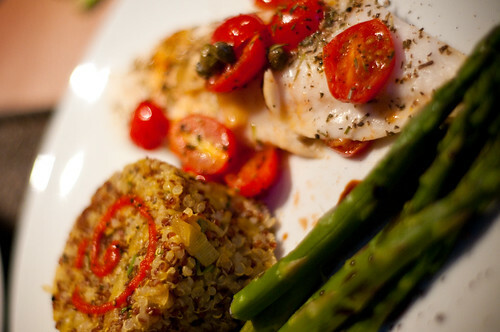 Sprinkle lemon with sea salt, pepper and herbes de provence. Put fish on top off lemon. Add more sea salt, pepper and herbes de provence. 3. Heat remaining 2 tablespoons oil in a 10-inch heavy skillet over moderately high heat until hot but not smoking, then sauté garlic, stirring occasionally, until pale golden, about 30 seconds. 4. 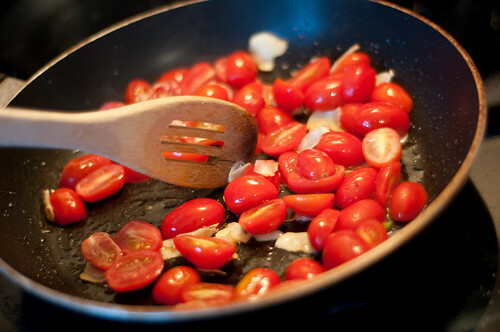 Add tomatoes and a pinch of salt and sauté, stirring occasionally, until tomatoes are softened, about 1 minute. Stir in capers. 5. 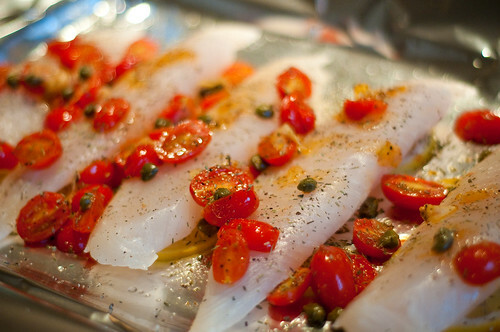 Spoon hot tomato mixture over fish, then cover with another sheet of foil, tenting it slightly over fish, and crimp edges together tightly to seal. 6. Bake until fish is just cooked through, 12 to 15 minutes (depending on thickness of fish - my fishsicles took 20 minutes); check by removing from oven and carefully lifting up a corner of top sheet of foil (don't be dumb like me and stab the middle, then necessitating a complete re-cover in order to put back in the oven...steaming is the entire point of this cooking method, so you don't want the steam to escape! ), pulling up sides of bottom sheet to keep liquid from running out. 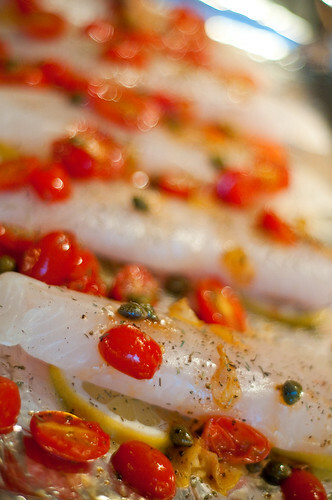 If fish is not cooked through, reseal foil and continue to bake, checking every 3 minutes. 7. Transfer fillets to plates (leave the lemon) using a spatula (be careful not to tear foil underneath) and spoon tomatoes and juices over top. Serve immediately. 1. 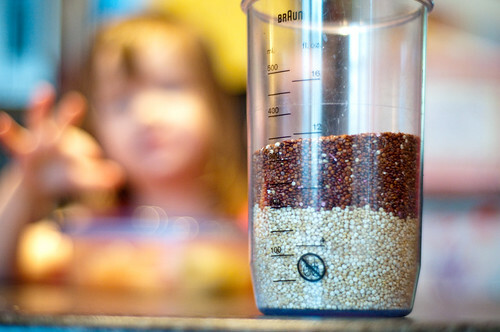 Rinse quinoa and place in a pot with water and a bit of salt. Bring to boil, then reduce heat and simmer (covered) until all water is absorbed (about 15 mins). 2. 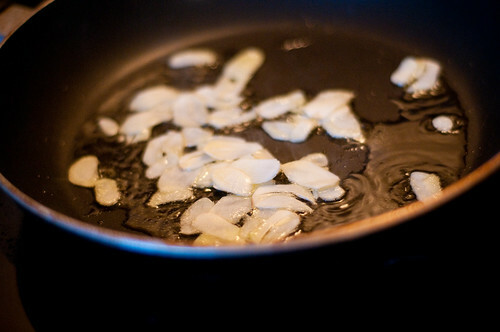 In a large skillet over medium heat, sauté onion and spices in oil until brown. I had some extra time, so I let my onion get a bit brown on the edges....yummy. 3. Combine onion, quinoa, (almonds), currants/raisins and fresh herbs. Season to taste with salt and pepper. I topped mine with a tiny swirl of sri racha....LOVE that stuff. And I'm not alone. You should get some. 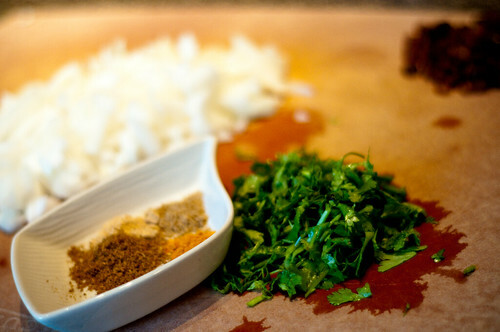 * Why do I grind my own cumin you ask? Not because I want my house to reek of fresh curried armpits, or because I am righteously indignant at the idea of pre-ground spice....mostly because I have, over the years, bought WAAAAAAY too many bags of cumin seeds. More cumin seeds than a person could ever use in a lifetime. 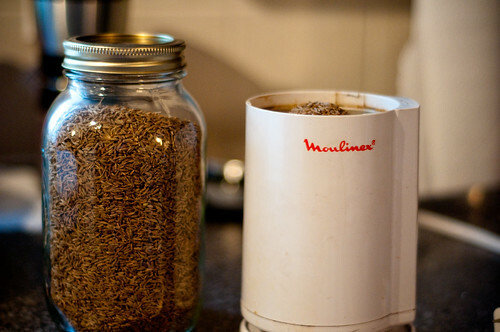 When I re-organized my pantry/spices a couple of months ago, I was shocked to see I could fill a four-cup mason jar with cumin seeds.....so until further notice, I have a special coffee grinder dedicated to the task of providing me with freshly-ground cumin. See? That's a buttload of cumin. 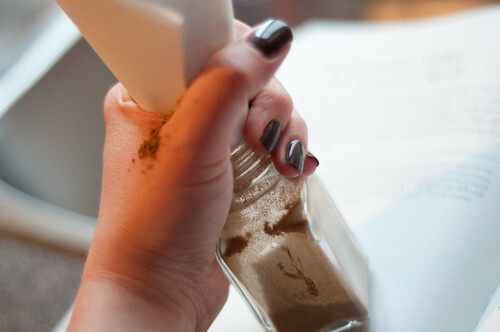 The only problem is that when it comes time to put the cumin in the spice jar...I don't have a funnel....but really, even if I did...for some reason, cumin powder just clings to itself. I always make an enormous stanky mess when I try to get it in the jar. Hi! Found your papillote recipe on pinterest and can't wait to try it tonight! I enjoyed your blog, too!